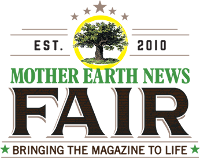 Live from the MOTHER EARTH NEWS FAIR in Topeka, Kan. Join us LIVE as homesteader and author Gianaclis Caldwell offers some important tips and advice from her workshop on best practices for handling goats. In association with The Livestock Conservancy. You are able to join virtually the excitement of How To Handle Goats with Gianaclis Caldwell. Watch a high quality LIVE video stream brought to you by Mother Earth News. Enjoy, interact and watch the live feed from any of your internet connected devices. On Nov 15, 2017 13:00 CST to Nov 15, 2017 14:00 CST you will come back here and watch the show LIVE!! The Mother Earth News team will be providing a video on demand replay of this event within the next 24 hours after the completion of this event to watch at your convenience. On behalf of Mother Earth News Cleeng teams provide support before, during and after the event. Due to high traffic just before and during the event, critical requests will be handled first, so please moderate your questions and only send if very urgent. Please try not to send multiple requests.